Dave was the intrepid eleventh-hour stand-in (or sit-in, since he was on crutches at the time) for Geoff Whitehorn, following the latter's sudden hospitalisation midway through the rehearsals for Procol's prestigious London showcase, and BBC recording, at the Dominion Theatre in London on 24 November 2014. 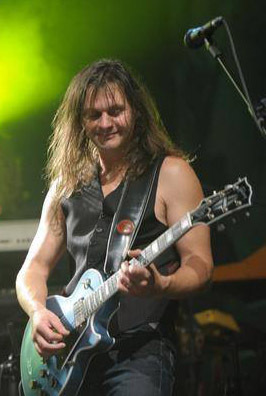 Dave was a bandmate of Matt Pegg's on the fortieth anniversary tour of Journey to the Centre of the Earth (Rick Wakeman and The New World Symphony Orchestra, accompanied by The English Chamber Choir and the English Rock Ensemble); they had previously worked together in the band of Francis Dunnery (his fellow-Cumbrian). Regarding his musical CV, Dave wrote to BtP ... 'Basically I have worked with the following artists – in random brain-fart order – Rick Wakeman, (Jon Anderson once), Go West, Brian May, Bow Wow Wow, Bucks Fizz, Belinda Carlisle, Francis Dunnery, T'Pau, Paul Young, Bananarama, Ozzy Osbourne, Ian Brown ... oh, and Procol Harum!